Bev (beestamper) from my Doubledog Dare Challenge (DDC) group challenged us to make a non-challenge card. I never was very good at math but wouldn't this challenge make this a challenge card thereby cancelling the non-challenge? LOL! I'm just pickin' on ya, Bev! Anywhooo, I've been anxious to ink up my coffee-themed stamps by Rubbernecker. Isn't that coffee bean background stamp a cool idea for us coffee lovers? I used the polished stone technique on the background and then stamped the coffee beans over that. I used Copic markers to color my coffee pot and mug. I like to finish off the inside of my cards as much as possible. For this one, I kept it simple. I black embossed the coffee pot inchie and also tag punched the corners to coordinate with the outside of the card. 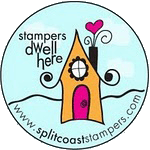 If you'd like to play along with us, just be sure to use keyword DDC when uploading to Splitcoaststampers! oh this is wonderful. i would not think to use blue for a coffee card, but, girl, this is gorgeous! 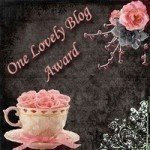 Charlene, those coffee beans are cool beans...love the background and fun color scheme! The inchie inside is adorable! Oh goodness - we used to have a coffee pot just like that, only red. Come to think of it, maybe we still do! I love the look of the coffee bean background. If I weren't saving for a fast camera lens I'd be off faster than you could grind the beans for a cup of coffee to check it out. The colours and angles make this a good guy card, too. Wonderful colors and image....and I don't think you cancelled yourself out!!! Love it Charlene, what a fun card! The colors are great...neat coffee bean papers! 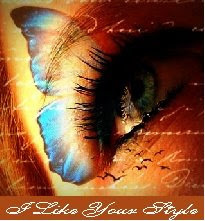 And I absolutely love the images and that sentiment...perfect! Love this coffee card - great colors and DP!! the 2nd half of the challenge was to send it annonymously to someone in the mail... did you miss that part?!?!? LOL!@!!! Boy, am I behind with my DDC challenges....it doesn't pay to take off for a week or so unless ya have someone to make cards while you are gone...I need an assistant!!!! You sure did a fabo job on this wonderful non-challenge challenge card!!!!! I love the colors, stamps, layout, inside....love it all, gf!!! Hope you had a great birthday, Charlene...I finally got your card in the mail...just don't look at the envie!! I had to make one cause I was out of the square ones. Hope you can figure out how to get it open...LOL!!! Hmmmmm...that non-challenge card challenge kinda sounds like the double negative I teach my kids about in Language Arts class. 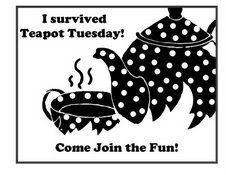 Fun card, though...makes me want to go have a cuppa!!! Hmmm, that polished stone background is awesome. Gonna file that one away! Awesome Bert!! LOVE the polished stone bg with those beans!! And the colors with those images are fabulous!